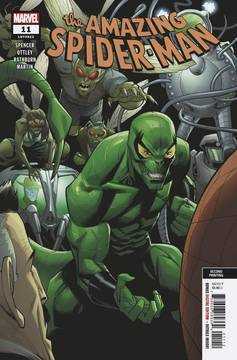 (W) Nick Spencer (A) Ryan Ottley, Cliff Rathburn (CA) Ryan Ottley • J. JONAH JAMESON has a new job as a shock jock, but is the world ready for a pro-Spider-Man JJJ? • More importantly, is Spider-Man ready? His post-secret-identity relationship with Jonah was already complicated, but this very public embrace may put him over the edge! • Spidey's definitely not ready for the Enforcers to come at him harder than ever! Rated T.